The scope of Social Media is an ever changing landscape and we as marketeers need to be focused on that every changing relationship that our consumers have with social media as well as how they utilize social media to engage with people, brands, products, networks, relationships, and more. Only then do we connect with them in a meaningful way. If social media does not enrich the consumers experience with your brand then your wasting time and effort and approaching it from the wrong perspective. Social media is ALWAYS about building a more effective brand connection with your consumer, and you must understand how your consumer utilizes social media well before you identify the campaign your going to enter. 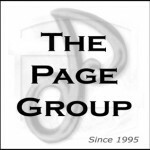 The Page Group is experts in this and are here to help you define and address how your consumers utilize social media and whether it sill add to your ability to build a strong brand connection with then…just call and let us explain how. 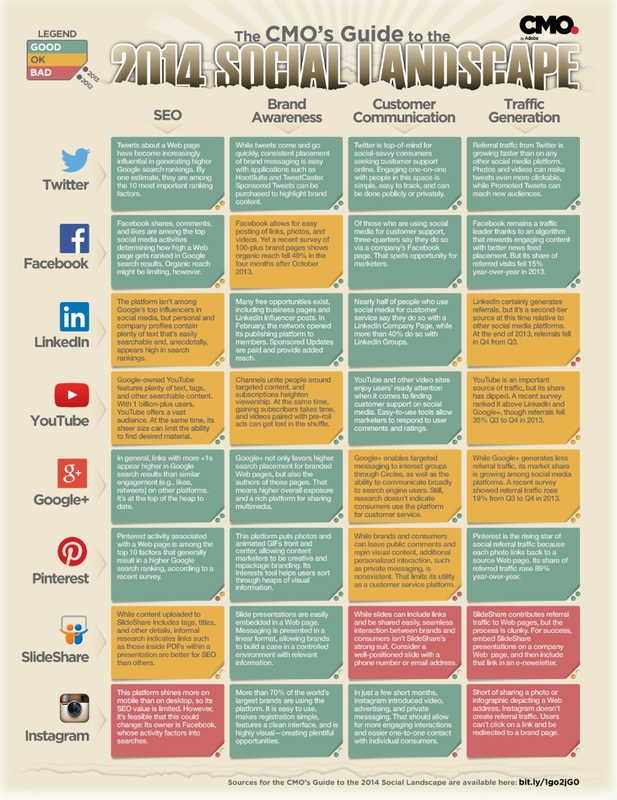 While other platforms have come and gone from our annual infographic–the first one ran in 2010–Facebook, Twitter, LinkedIn, and YouTube have been mainstays. As for the definite “maybe,” well, that’s about as solid as it gets on the social scene. For this year’s guide, CMO.com teamed with data visualization specialist Visual.ly to help with both content and design. For 2014, the Big Four are joined by newcomer SlideShare, 2013 entries Google+ and Pinterest, and Instagram, which makes its second appearance since 2012. As in past years, each platform is evaluated by four key criteria: SEO, brand awareness, customer communication, and traffic generation, with performance compared with the past two years (except in cases where the platform was not previously included). We think you will find it to be a valuable year-round resource–and one worth sharing with co-workers and colleagues.